Preheat oven to 375°. Put bacon in a medium pan, cover with cold water, and bring to a boil over medium-high heat. Boil for 5 minutes, then drain. Return bacon to pan and cook over medium heat until lightly browned, about 3 minutes. Transfer bacon with a slotted spoon to a paper towel to drain, then arrange on bottom of the par-baked crust. 4. Beat eggs, cream, and salt together in a medium bowl and season to taste with nutmeg and pepper. Pour mixture into your par-baked crust and bake until custard is puffed and golden and just set in the center, 30-35 minutes. Slide quiche off parchment paper onto a serving platter and remove ring. 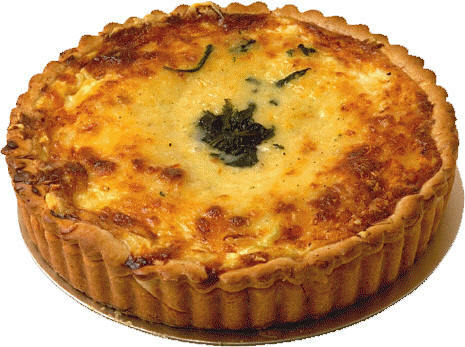 Serve quiche warm or at room temperature, sliced into wedges. 1. Sift together flour, salt, and sugar into a mixing bowl. Use a pastry cutter or two knives to work butter and shortening into flour until it resembles coarse meal. Sprinkle in up to 6 tbsp. ice water, stirring the dough with a fork until it just begins to hold together. Using your hands, press dough firmly into a rough ball, then transfer to a lightly floured surface. Give the dough several quick kneads with the heel of your hand to form a smooth dough, then shape into a ball, flatten slightly to make a round, and dust with flour. Wrap round in plastic and refrigerate for 2 hours. 2. Preheat oven to 400°. Allow dough to soften slightly at room temperature before rolling out on a lightly floured surface into a 14'' round. Fit dough, without stretching it, into a buttered 10'' bottomless metal flan ring, 1 1⁄2'' deep, set on a parchment paper-lined cookie sheet with no rim. Press overhanging dough down slightly into sides of ring to make the sides of the crust a little thicker and sturdier. Run the rolling pin over the top of the ring to remove any overhanging dough. Using a fork, prick bottom lightly, then make a decorative edge around the rim. Line dough with buttered aluminum foil, then add pie weights or dried beans. Bake until crust is set and edge just begins to color, about 25 minutes. Remove foil and weights, brush bottom and sides with egg, and continue baking until crust is pale golden, another 2-5 minutes. Melt the butter and pour into a 9" X 13" pan. 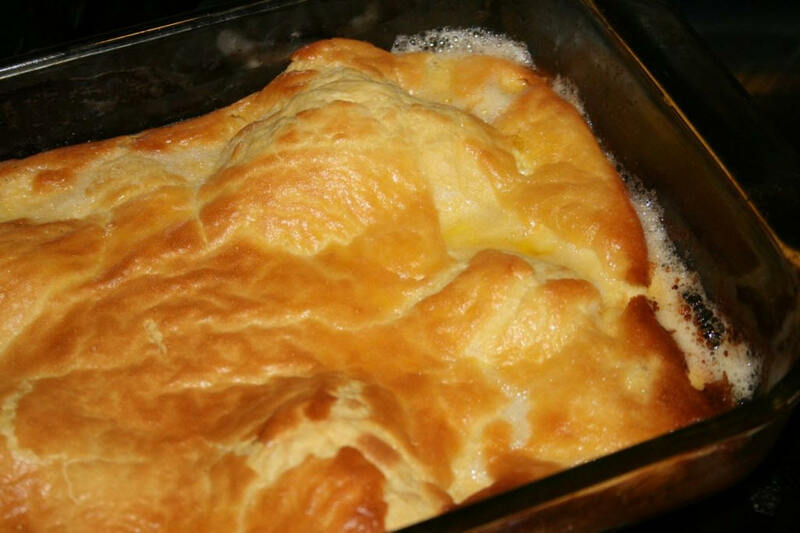 Blend the eggs, milk, flour, salt and vanilla for one minute. Pour the batter into the butter in the pan. Bake for 20-25 minutes until lightly brown and fluffy. Enjoy with strawberry freezer jam or maple syrup.